Light of Kabbalah . Oil on canvas ( work in progress ) Inspired by reading Mystical kabbalah by Dion Fortune, & time spent living in Jerusalem many years ago. 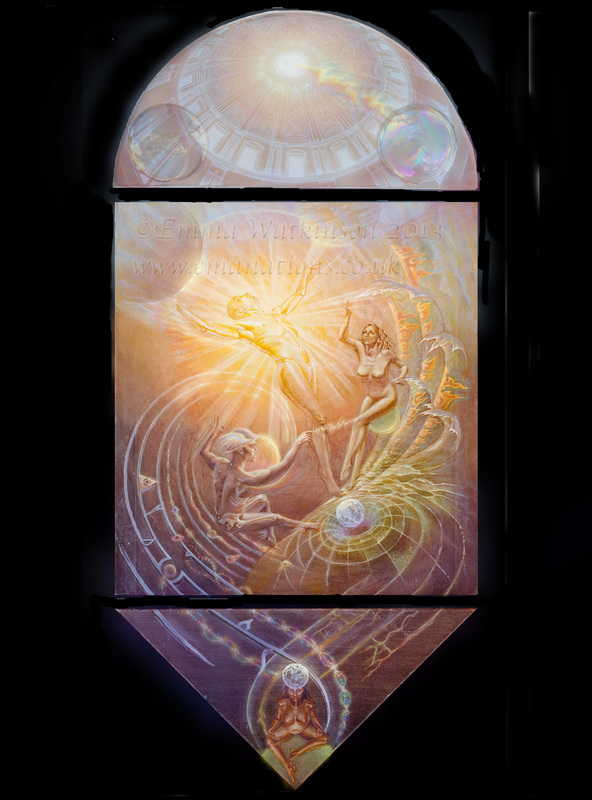 A vertical Triptych, it illustrates the journey through Tree of Life. Light emanates from oneness beyond duality above, lightning strikes the first Sephiroth with pure masculine energy, & is recieved by the archetypal womb sphere, Binah. Across the abyss, the 2nd panel, is Adam Kadamon, the central 6 sephiroth. Jupiter & Mars above, Tiphareth is central, beauty , sacrifice & harmony. Balanced by Venus on the right, Love & emotion, & Mercury on the left, intellect & magic. The energy flows down into the realm of dreams in Yesod, then, over another veil, the 3rd panel, into Gaia, Malkuth, the bride of Adam, manifest earth. Kabbalah charts the manifestation of Spirit into matter, & also, the evolution of consciousness from matter to spirit.